The thematic group “Integrated Planning” deals with activities and projects that facilitate integrated planning practices towards more sustainable urban mobility. Cooperative and systematic planning approaches, which integrate stakeholders, develop measures and measure packages balancing all transport modes, and are accompanied by monitoring and evaluation actions to measure achievements, are the basis for a strategic development of a sustainable transport network and mobility patterns. The work is oriented towards the principles of the European Commissions’ concept of Sustainable Urban Mobility Planning (SUMP), which is a showcase for a new planning culture for European cities and regions. SUMP also opens up the possibility for governance and planning processes to integrate the urban transport network into regional and upper-network levels such as the Trans European transport network (TEN-T) in order to ease the burden of traffic on urban areas and to improve connectivity. Integrated planning approaches are also becoming more and more relevant for cities in emerging and developing countries, in order to tackle increasing motorisation and negative impacts of transport movements. Key words for our thematic group are: Sustainable Urban Mobility Planning, Governance and stakeholder cooperation, Urban and regional planning, and development of Urban Nodes in the TEN-T, SUMP in developing and emerging countries. For more information on integrated planning and SUMPs, please contact the thematic moderator Susanne. Cities play a key-role in the deployment of electric vehicles. Ideally the deployment is part of a structured and effective strategy that blends in with the city’s Sustainable Urban Mobility Plan. Electromobility measures can help to reach SUMP targets such as air quality improvement, noise mitigation, reduced energy use, and decreased car dependency. With this CIVITAS Insight, the CIVITAS CAPITAL project wants to provide information on e-mobility and its integration in SUMPs. As we are interested to get your views and ideas by 14 July 2016, all members of this Thematic Group have the possibility to contribute to the content of this CIVITAS Insight. If you are interested to contribute, please leave a message here! The “sharing” paradigm is shaking up the global economy scenario. People across the world are daily sharing an increasing number of material objects and immaterial services (from clothes and tools to houses, working spaces and also professional skills). This revolution is affecting all the economic sectors, though at a different pace. No doubt the mobility sector is among the ones facing the greatest and revolutionary changes. Although sharing options have always been available for transport, first with Public Transport and taxis and more recently with car or bike-sharing and car-pooling services, what is happening in these past few years is a radical change in the way all of us could rethink our mobility habits. Thanks to most advanced communication technologies (internet, social media and ITS) and to their integration, is now easier and immediate to find opportunities to share rides, vehicles (cars and bikes) and also parking spaces. Mobility is starting to be considered as a “unique “service and people across European cities are now looking for the best mobility options (and a combination of them), with a flexible approach un-known before. So, disruptive changes are coming: how cities can adapt and actively react to these changes in order to exploit all the potential benefits of these changes towards the achievement of a sustainable urban mobility? How transport policies can offer and answer to the needs of people and to their increasing bent to share mobility? Which are the most interesting solutions and good practices have been adopted by cities at the forefront? 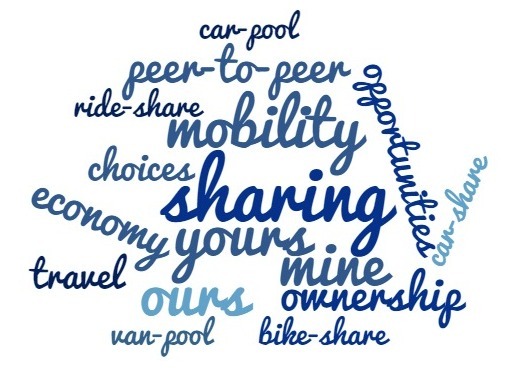 Sharing mobility is an hot topic: starting with the past @CIVITAS FORUM 2015 “Sharing the city”, to a number of upcoming events (@ the 3rd European Conference on Sustainable Urban Mobility Plans on 12nd-13rd April 2016 in Bremen and @ECOMM – European Conference on Mobility Management from 1st to 3rd June 2016 in Athens) the theme has been debated and continues to be debated among transport experts, politicians, professionals and representatives from urban, regional and national levels. CIVITAS WIKI is now drafting a policy note on this topic with the aim to provide a brief but smart tool for cities offering a comprehensive overview on shared-mobility concepts, applications and practices (both the more consolidated and the innovative ones) to support decision/policy makers and urban mobility professionals in mobility planning. Scope of this collaborative interaction is then to collect further resources, hints and suggestions, links to practical city experiences and, obviously, opinions and comments on this topic. For sharing your ideas, resources and thoughts on sharing mobility, please contact Simone Bosetti and Caterina Di Bartolo. Do you believe in the potential of tracking? As part of the TRACE project (www.h2020-trace.eu), funded by the European Commission under the umbrella of the Horizon 2020 programme, we invite you to participate in an online survey on walking and cycling tracking services. TRACE is a European project with 12 partners in 8 countries. The aim of TRACE is to assess the potential of using tracking data (i.e. location and travel habit data) in cycling and walking promotion initiatives and in urban mobility planning. Your answers will allow us to take your needs and requirements into account when developing our tools. Completing the survey will take about 10-15 min. Those who complete the survey will have the opportunity to enter a contest to win a Motorola Moto G2015 smartphone. If you are a public authority or related stakeholder (mobility professional, urban planner, decision maker, national/regional authority, consultant, etc. ), please fill your questionnaire here. If you are an user association, a mobility organisation or a stakeholder related to the user perspective, please fill your questionnaire here. Feel free to forward this invitation to your colleagues or contacts who might be interested in the topic. Thank you in advance for your time and for your input! Ageing in the suburbs: a transport disaster waiting to happen? Here's an interesting reflection from the US about the ageing population in the suburbs. The generation of baby-boomers (now between ages 50 to 68) and older represent 60 percent of the owner-occupied homes in America. Many live in highly car-oriented suburbs. When they will no longer be able to drive, demand for costly public transport services in low-density areas will probably increase and the risk of transport poverty will lurk around the corner. The article proposes some promising solutions to allow baby-boomers to age in place, such as self-driving cars, the sharing economy and redesigning cul-de-sacs as hubs for communal living. I'm interested to know if this trend is also present in Europe and how cities plan to face the challenges associated with this prospect? The daily functions of a hospital depend on countless moving parts –– quite literally in the case of reliable transportation. A pilot study in the Capital Region of Denmark shows that delivery times between hospitals could be halved if electric cargo bikes are used. CIVITAS INFOGRAPHIC : Smart choices for cities: Cities towards Mobility 2.0: connect, share and go! transport needs to be addressed through international collaboration. that need innovative solutions, of which sustainable transport is high on the agenda.